This is absolutely the best tasting coffee there is. I wouldn’t buy anything else. It’s delicious, every cup – just like you’d want coffee to be. — It took me years of searching to find a coffee brand and blend to say that of. I tried everything. I tried grinding my own beans. I tried Starbucks. I did research all day online to find a delicious cup of coffee, and for years I failed to find one. Then one day I happened to buy an iced coffee at a donut shop called “Dippin Donuts”. WOW! it tasted SO good I had to go back in and ask what brand of coffee they were using. “NEW ENGLAND COFFEE”, she said. But exactly what blend, she didn’t know. So I tried a few, and it’s hands down the Columbian Supremo. This is the stuff! So be careful when you pick up your coffee at the store, because the Columbian and the “breakfast blend” both have a red label on the bag, and if you grab that breakfast blend by mistake, thinking it should be approximately the same anyway..oh, it’s not! You want the Columbian Supremo. 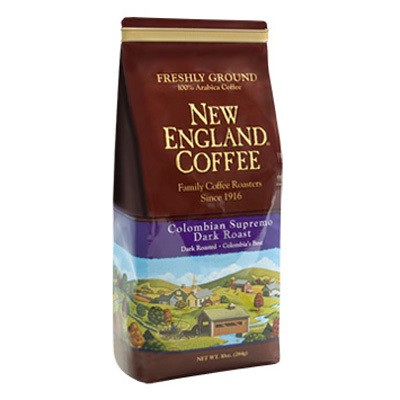 New England Coffee Columbian Supremo. THIS is the coffee that each and every morning I say “yum” when I sit down with it and greet the day. And I find my day goes better when I don’t have to start it out by going “yuck”…at my breakfast! So – for me anyway – the thing is to be careful when you pick up your coffee at the store, because the Columbian and the “Breakfast Blend” both have a red label, and if you grab that breakfast blend by mistake, or thinking it should be about the same anyway..oh no, it’s not! You want the Columbian Supremo. 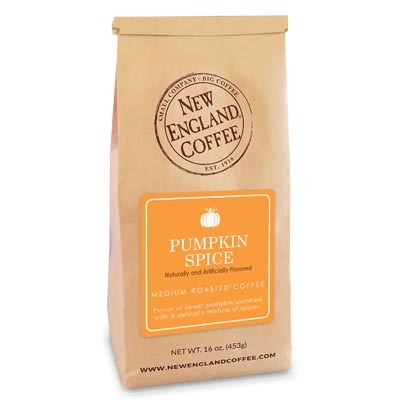 New England Coffee Columbian Supremo. THIS is the coffee that each and every morning I say “yum” when I sit down with it and greet the day. And my day goes much better when I don’t have to start it out by going “yuck” at my breakfast! Hello there all! I’m 30 years old and have never been a coffee drinker untill about 2 years ago my wife made her usual in the morning and I just randomly figured today would be the day I try coffee!! So I took a sip and kinda enjoyed it and ever since I’ve been trying all sorts of coffee’s to see if there’s one out there that just knocks my socks off!! Well your obviously reading this article , so you know I’ve found “THEEE” coffee!! 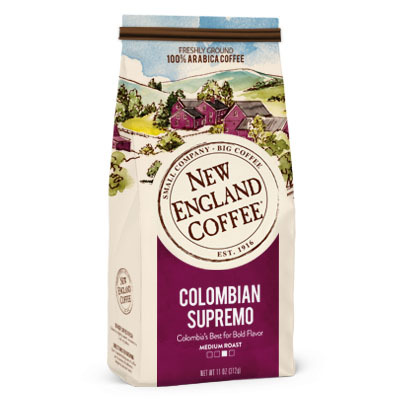 NEW ENGLAND COFFEE’S ” COLOMBIAN SUPREMO” is just BEAUTIFUL!! You know that sip of coffee that makes your eyes close and makes your mouth smile!!??? Well this stuff will do it every time!!! The thing I love most about it is how SMOOOOOTH it is. I mean literally it is a smooth feeling. Anyway that’s my two cents worth!! Now go get some Colombian supremo coffee! !